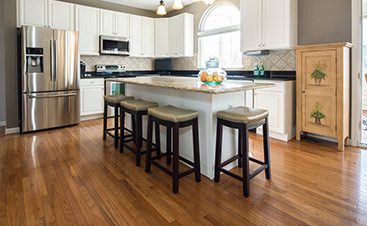 When we think of home improvement and maintenance, we often think of interior rooms and their design. If you’re lucky enough to have an outdoor deck, it requires maintenance to stay in top shape. A deck extends your living space to the outdoors and can provide a beautiful setting for relaxing as a family or entertaining with friends. Not only that, keeping your deck in good condition can help maintain its value as a part of your overall home value. With that in mind, and with fall just around the corner in NJ, we put together the following tips on how to maintain your NJ wood deck texture for the upcoming seasonal change. If you want to keep your deck in tip-top condition, then regular maintenance is key to keeping your deck looking its best. Seasonal changes are a good time to check in on how your deck is doing and perform repairs and routine maintenance. 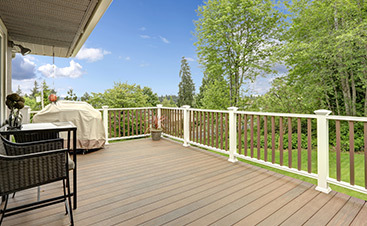 With the different weather that comes with each season (rain, heat, snow), you will want to be sure to protect your deck from the particular seasonal elements ahead. Fall is a great time of year to carry out deck maintenance – the days are cooler, but dry, giving you the ideal weather to carry out any treatments. 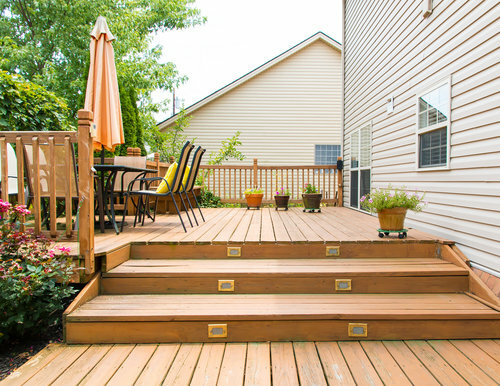 Begin with a routine safety check to ensure that your deck is not in need of any repairs. Make sure your railings are firmly attached – loose railings will not only look unsightly, but could make your deck dangerous too. A visual check will give you the first clue, but follow up with a firm shake of each railing to be sure each one is securely attached. Again, for both looks and safety, check your wood is in good condition, with no signs of rot, splinters or warping. Inspect each board, lightly pushing with a sharp object to identify any wet areas. 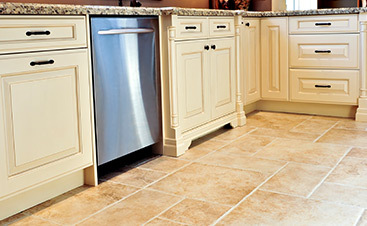 It’s especially important to check that each step is in excellent condition with no signs of splitting or warping. As wood expands and contracts with changing temperatures, existing nails, screws and bolts can start to become loose. Review your deck carefully for any areas where this may have happened – it’s important that loose nails are removed (and replaced, perhaps with screws) and that fastenings are tightened. After you’ve completed your safety check, you may want to consider calling in a professional to ensure any faulty boards are replaced safely and securely. Before the bad weather sets in, take the time to clean your deck thoroughly being sure to remove any mold and mildew. Take care with power washing, it’s not always the best way to clean your deck and in fact, can do more harm than good – you can damage the wood and leave uneven marks on your deck. Again, working with an experienced professional may be worth it for the longevity of your deck, and in fact, sanding may be a better alternative particularly if you are considering sealing. You might want to consider this sealing step if you did not carry this out in the spring. Sealing the wood ensures that water is not being absorbed and will help your deck last longer. Put away any furniture you won’t be using for the next season, and remove planters – leaving these on the deck through winter can result in stain damage to the wood. Remove any debris, and be sure to remove any piles of leaves that have started to find their way into the corners. Once the hard work of checking and protecting your deck has been completed, it’s time to turn your hand to some of the more enjoyable aspects of deck care. Just because the temperatures are dropping, doesn’t mean you can’t still enjoy your outside living space. There are many ways to keep warm on your deck during fall weather. Stocking up on some cozy blankets to have on hand so you can enjoy a hot chocolate in the cooler temperatures is a cost-effective way of staying snuggly. Hurricane lamps are another option, or if you want to take it to the next level, consider installing wall-mounted infrared heaters. Pillows and cushions can make your deck more inviting and will entice you out to enjoy some fresh air when you might not otherwise. While it’s not a good idea to keep planters on the deck when water will be likely to accumulate and cause staining, using elevated tables and stands with potted plants can provide an excellent alternative to add a pop of color to your deck. Look for flowers that bloom in autumn, such as asters and helenium. To add further enticement to your deck area, look around for some fun gadgets to enhance your outdoor experience – from wireless speakers to solar lights, this list will provide you some inspiration for some hi-tech fun!